Few running apps are taking advantage of watchOS 2 yet, but they should. The Apple Watch’s health and fitness features are among its biggest selling points. Many people have said the watch’s activity-tracking capabilities have helped them lose weight or become more active. In one instance, the watch’s heart rate sensor actually saved a life. I use the watch’s built-in Workout app to track my morning runs, because it’s easier to use and more responsive than any of the third-party running apps for watchOS. But I was hopeful that those apps would improve dramatically with watchOS 2, which lets apps run natively on the watch and tap directly into its sensors. But that’s not the case, at least not yet. 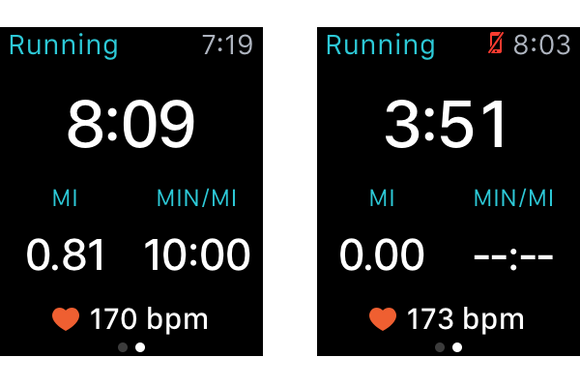 I revisited the running apps I tested when the watch launched back in May to see if watchOS 2, which was released to developers in June and to the public in September, made a significant difference in the way they track workouts. Two of the apps, Nike+ Running and MapMyRun, haven’t been updated for watchOS 2 yet and feel incredibly sluggish compared to Runtastic and Runkeeper, both of which have been updated. Runkeeper is now leading the pack of Apple Watch running apps, because it’s the only one (aside from the native Workout app) that will track your run without your phone nearby. Runtastic, which also runs natively on the watch and can track your heart rate, became unusable when I left my phone at home. The sad error message on my wrist read, “Your iPhone is not reachable, please connect the watch to your iPhone to start an activity.” When you take your phone along, Runtastic taps the watch’s sensors to show your heart rate while running, but unless you upgrade to Runtastic Pro, the app won’t store that data for you to look at later. Runtastic was my favorite third-party running app for the watch when it launched, but Runkeeper now tops the list. Runkeeper tracks your runs, including your heart rate, with or without your iPhone nearby. The Apple Watch doesn’t have built-in GPS, so if mapping your mileage is important to you, you’ll still need to take your phone along to see maps in your running apps. But if maps are unimportant, you can sync Apple Music or iTunes playlists to the Apple Watch and take a pair of Bluetooth headphones on a run and leave your phone behind. Where have all the watchOS 2 updates gone? Apple’s upgraded watch platform was supposed to be a gamechanger. Developers can now build native apps for the watch instead of mirror limited functionality from iPhone apps to the watch’s tiny screen. They can tap into the watch’s heart rate sensor, accelerometer, Taptic Engine, Digital Crown, speaker, and microphone. But few apps have been updated to take advantage of all those capabilities. Nike+ Running and MapMyRun, which I tested back in May, are still chugging along on watchOS 1. Strava, the biking and running app the Apple heralds on its watchOS 2 promotional site, also has yet to be updated (though we hear the app is currently being beta tested and is expected to roll out soon). 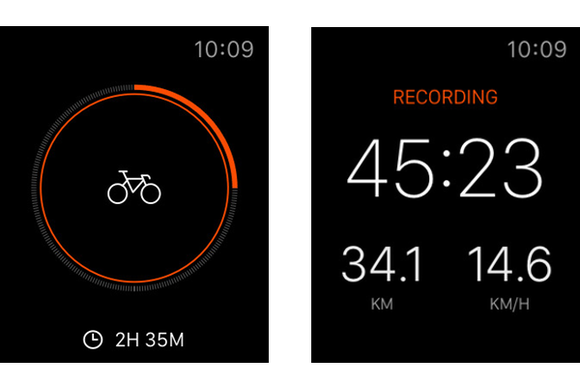 Strava's watchOS 2 update will let the app track your heart rate on runs and bike rides. Nike is a long-time Apple partner, but its app also remains stuck on watchOS 1. Millions of Nike fans bought in to the fitness brand’s own activity-tracking ecosystem with Nike FuelBands, which the company discontinued, and have been clamoring for Nike to add its proprietary NikeFuel measuring system to its Apple Watch app. That could be coming down the line with a watchOS 2 update, but the company didn’t respond to my request for comment. The thing about running apps is that if you’ve been using one to track your mileage for any length of time, you won’t want to switch to something else. Few will choose an app to track their runs based solely on Apple Watch performance, but the watch is being marketed to fitness enthusiasts who want their favorite activity-tracking apps on their wrist, and to do things that their phones can’t (like track heart rate). We’re still waiting for apps to live up to those expectations, but the future looks promising.